Why did our Muscari only bloom after lawn mowing? Our bulbs were in the Central California lawn when we moved in. We learned of them after our first mowing-They bloomed! I rescued the rest of the Muscari into a dirt planter, in which they grew very tall, but never bloomed. Why? Now that they have gone to seed, what should I do with the bulbs and seeds (They need to be transplanted for more room). Caution not to plant near certain fruit trees: True? I don't think the mowing really had anything to do with it so much as the variety that you may have. There are some types of Muscari that will actually bloom later than the earlier sping bloomers do--late spring to early summer, in fact. 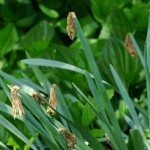 This could be the reason for their sudden blooming. If you moved them during flowering, this would also have affected the blooming cycle, which is why they stopped. In addition, the soil in your planter (if different from where you dug them up) could be lacking phosphorus, which promotes blooming. No worries though, they will return again next season.